Overview: The striking theme of this smooth-as-silk 5 reel, 9 pay-line game is all Australian, replete with crazy Kookaburras, wandering Wombats, cuddly Koalas, laidback Wallabies...and very profitable Free Spin boomerangs to multiply rewards. The "No Worries' logo becomes especially meaningful when it completes winning combinations as the Wild, and for Scatters there is a way-out Tasmanian Devil to help build fortunes to Dreamtime levels. Yes, this is a true-blue Aussie video slot with it all - Wilds, Scatters, Free Spins, multiple multipliers and even a Gamble feature at the end of a Free Spin cycle. By forfeiting original wins, the player gambles on improving the results in this option. Alternatively, players may prefer to collect on the original win-.or take a flyer on a mystery prize that could be anywhere from 2x to a jawdropping 150x total bet. 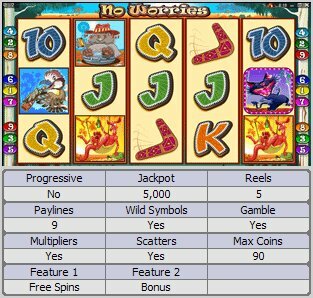 Similar Slots: If you like No Worries, you might like these other 5-reel slot machines: Avalon, Chain Mail, Path of the Penguin, Summertime, Sure Win, Wooly World.